Wilfried Bony feels his Manchester City experience can help Swansea shock the runaway Premier League leaders on Wednesday night. City can set a new league record of 15 consecutive victories at the Liberty Stadium by beating Swansea opponents who have won only three times in the top flight all season. 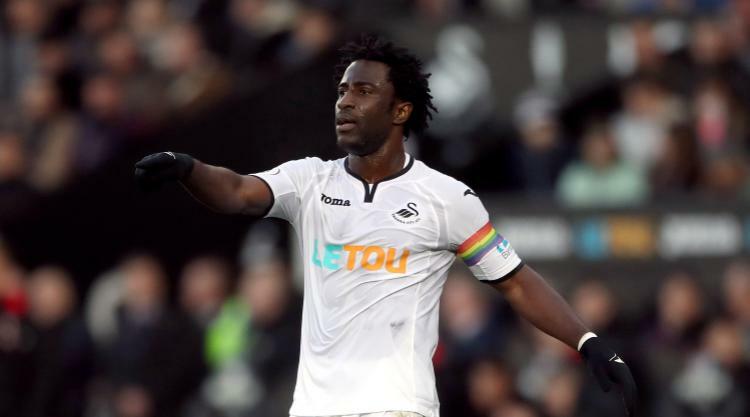 But Swansea have been buoyed by the weekend win over West Brom when Bony's late strike saw him score in successive games for the first time since December 2014. That was a feat Bony never managed in a frustrating two-and-a-half year City spell - the Ivorian striker scoring only 10 goals in 46 appearances following his £28million move from Swansea in January 2015. "When you come from a club where you play every game and then you are playing maybe once a month or two games a month it is completely different," Bony said of his injury-hit time at City. "But that is the past, it is always a lesson. I am still the same player I was before, but I have experience now. "I feel I always learn and maybe I can share some of my City experiences to help my team. "We all know it is going to be a difficult game, because they are top and very good at the moment. "It is normal they win every game, and we know what we have to do. "We just have to focus on ourselves, what we can do better and how we can improve." Bony's injury issues saw him start only two league games in the opening three months of the season following his Â£12million return to Swansea in August. But Bony has now scored against Stoke and West Brom and given Swansea a much-needed focal point in attack. "I didn't play for a long time," Bony told Press Association Sport. "When I came here it had been almost six months since I last played in the African Nations Cup in January. "I have been working very hard to be fit, but to come back and try to play is not easy. The Premier League is not like training. "I almost forced myself to get myself ready and do my best for the team. "The most important thing is to be fit and ready and when the chances come I will score." Swansea's weekend win took them to within one point of safety and Bony believes it is a battle that they can win. "We need the same winning mentality we showed against West Brom," said Bony, who has been Swansea skipper in recent weeks in the absence of Federico Fernandez. "We will need it from the first minute to the end and not give up. "We don't want to be in same position as last year and I am confident we can do it because the group is good and we train well."